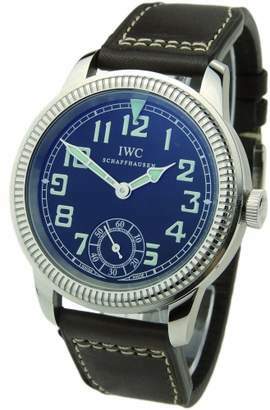 This pre owned IWC Pilot's Vintage Collection stainless steel wristwatch on a leather strap is in pristine condition. Featuring a black dial with luminous numbers, this is the IW325401 model. Its 44mm case houses a hand-wind mechanical movement which has been thoroughly checked by our experienced onsite watchmakers and is in full working order. This watch comes with IWC box, warranty papers and instructions, along with our Parkers 12 month warranty 3327839 ALL VIEWINGS ARE BY APPOINTMENT. Please call 0114 2343365 or email contact@parkersjewellers. co. uk with the SKU reference number of the watches you would like to view.